Yes, I know, this blog is late! No real excuses except I’m busy getting all the work together for the various exhibitions coming up this autumn ..and it’s already the end of the third week in July. 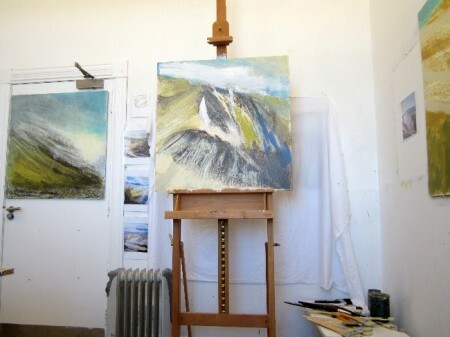 And of course, new paintings demand new information, new inspiration … in the way of me getting up and out into the hills. So then, this week has once again been made up of painting with a day walk added for good measure. The new paintings are coming on well I think and I now have 9 of the larger 80 x 80 cm pieces completed (or almost) ….but I’ve sold one of these at my Blairmore exhibition …so in practice I have eight. I currently have two more pieces on the go and plans for another two following a very informative and beautiful walk on Saturday. This would give me the ten large pieces for Speyer in October with a couple of others for the exhibition in Dundee in mid September. But I would still like to get a couple more finished at this size too. That I think means six more large pieces to complete before the end of September …and no doubt a few smaller pieces too. It certainly means putting in the hours at the studio and so days like today where I’ll be bashing away at this computer are going to have to be cut back a little …. I’m afraid my next few blogs may be somewhat shorter and more thrown together than normal!!! In the midst of all this rushing around I also have the Wasps Open Studios Weekend to prepare for ….this is being held on Saturday / Sunday 1st & 2nd October. I’m not sure quite how many of the Courtyard Studios artists are taking part this year …but I think that the usual crowd of us will be there again this year …so as always, it’ll be a good and varied selection of work on display. If you’re a local to Ayrshire then make a note in your diary. If you want to be added to my mailing list for this and other events just drop me an email to; keith@keithsalmon.org or click on the red link at the bottom of the page to subscribe. As I said though, the week ended with another fine walk. Once again we were tracking the weather via the Mountain Weather Information Service and matching it with available days …not many this week with my partner Anita working more but shorter shifts for the next few weeks. Saturday though looked good for both of us and indeed the weather was superb over in the west of Scotland and so a trip to the Ben Cruachan group of hills seemed like the place to go. Over the last few years we’ve walked most of these large and rugged mountains but there is one hill we’ve never visited …Beinn a’ Bhuidh. This slightly more modest hill rising to just below 900 m sits above the Cruachan Reservoir and just to the SE of Ben Cruachan. 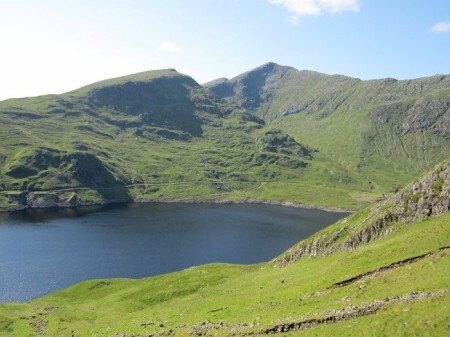 It’s location as a view point both for the fine mountain scenery and the large expansive views west along Loch Awe and right out to the sea and the mountains over on the Isle of Mull …well, I doubt it can be beaten. We decided to go for the short steep option ..but one that gave us the maximum view. Parking at the side of the main road a kilometre to the west of Lochawe village we followed the hydro road up to the Cruachan reservoir dam. 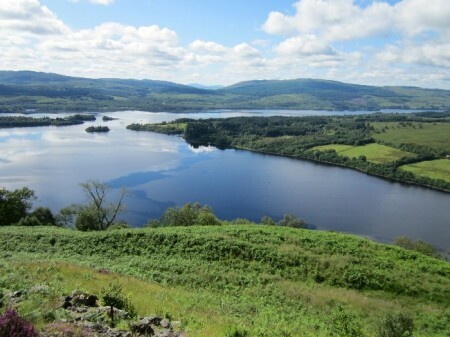 It gains quite a bit of height and is a bit of a slog but the views out over Loch Awe and the Pass of Brander are superb and it makes a good and pleasant start to the walk. From the dam though …well, it’s straight up with the deep blue of the reservoir looking stunning with the rocky Cruachan peaks all around. Beinn a’ Bhuidh is quite rocky too and the higher sections are made up of numerous small broken crags and jumbles of boulders which need avoiding or clambering over. 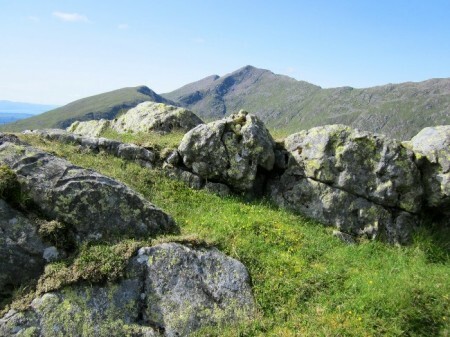 The steepness doesn’t really let up until almost at the top but with all the rocky outcrops and the huge and ever expanding views as you gain height, it makes for an enjoyable haul. We returned virtually the same way but the weather was so good that on both the ascent and descent, we spent much time just sitting and looking …and at one point …dozing. It was so peaceful and so beautiful. 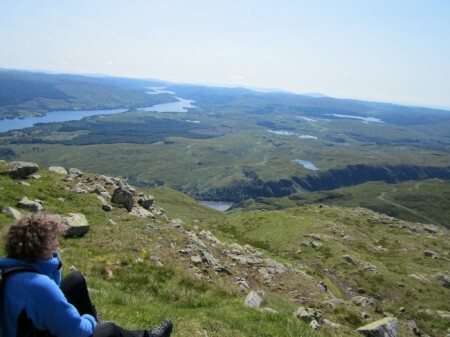 Interestingly, the rock formations of the main Cruachan hills were quite amazing. As the afternoon progressed the shadows started picking out the various layers of the rock. These seemed to change direction in different places and reminded me very much of some of the marks I make in my paintings. As I sat looking at this wonder of nature I was already planning my next couple of paintings. We got back to the car about 7pm and had a stunningly beautiful drive back through the southern highlands under a cloud free sky with the hills almost glowing in the low evening sun. Sunday was to have been a trip up to Stirling to attend the preview of an exhibition by Lorraine Nicholson, but with everything building up, my blog and work of the week still not written and paintings urgently needing finishing …well, I just had to get back down to the studio. It was worth it though as I did manage to finish one piece and had a couple of folk in to see the work. No sales but they were enthusiastic and went away with some of my post cards …so who knows where those may end up. It’s a good way to promote the paintings and of course each card has my website address included on the reverse. Right then…back to the painting!